Most of us law students love to hear our own voices. We are former debaters, mock trial masters, model U.N. buffs, and armchair analysts who attended law school in part, I suspect, because we believed we could use our loud mouths and over-zealous opinions to make a living—and, in many cases, to make a difference. For some of us, therefore, it was a shock to find out that, unlike Law and Order and Grisham novels, the vast majority of legal cases settle quietly before reaching the dramatic stage of trial, and most lawyers—especially young associates at well-paying law firms—rarely see the inside of a courtroom, let alone speak in one. This reality hits home in first-year classes in which we are only allowed to speak when called on, often only two times per semester, by a professor who loves to hear his or her voice even more than we do ours. Teachers, perhaps more than lawyers, love to hear themselves speak. I would know. While teaching teenagers for three years in New York City, I lived for the moment when my classroom would become utterly quiet, with twenty-five hungry minds listening intently and gratefully as I dropped bits of verbal knowledge into their heads like a mama bird feeding her young. Unfortunately, that moment never came, which is why I went to law school. Now, us law students, and especially us teachers-turned-law-students, find ourselves in a predicament. We miss our respective soapboxes but spend our waking hours in classrooms and libraries that require silent concentration above all else. One possible outlet for our oral angst is to raise our hands when professors occasionally allow random questions, but we must beware of volunteering too often, thereby inviting the label “class-hole” from our peers and thus being blacklisted from social interaction at student-government-planned events. Another option is to join said student government, or another student group like the Education Law Association, so that our résumé-enhancing peers have no choice but to listen to what we say—especially when we finagle our way into a leadership position. Yet another option is to unload our verbal surplus on our friends, girlfriends/boyfriends, family members or spouses, by boring them to death with anecdotes about the forementioned professors, class-holes, student-government-planned events, and student organizations. I have clearly attempted all three options. But even so, those of us of the silver-tongued persuasion still cannot get enough airtime. And so, last year, members of the student government, in collaboration with the Legal Follies (our one-of-a-kind student sketch comedy/singing/dancing/instrument-playing troupe) started hosting bi-annual open mic sessions at a local campus pub. What better way to break our self-imposed solitude than by giving us a platform, a microphone, and an audience of bedraggled law students attending as much for the cheap beer as for the live entertainment. 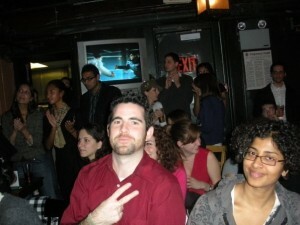 At my first open mic last Fall, I performed two spoken word poems I had written while living in New York City (a more creative period of my life), and the audience seemed to enjoy or at least tolerate my performance. In turn, I thoroughly enjoyed my peers who delivered stand-up comedy, sang solos and duets, and played guitars/drums/tambourines/harmonicas. I realized, for one of the first times in law school: some law students are pretty cool. In fact, many of them are far cooler than I, who cannot play Beatles songs on my guitar while singing and swaying nonchalantly with flowing Hanson-like blonde hair. This year, I wasn’t going to attend the open mic. I was coming from a networking dinner downtown in my suit and tie, without in umbrella, in the cold November rain. I figured I had heard most of the likely performers already twice before. But, it was Thursday and I was tired of studying, as I usually am by Thursday. And the pub was on my way home. So I went. 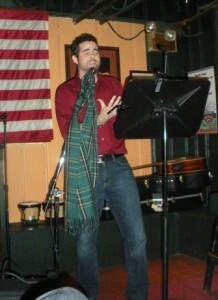 As always, the open mic completely transformed my mood. I enjoyed the usual guitar and singing acts, found myself singing aloud with the crowd, and at one point tried to relive my college a cappella days by breaking into harmony. A friend who helped plan the event, the one with the Hanson hair, even convinced me to perform the same slam poem about teaching that I’d delivered the previous year. I loved the thrill of performing, as usual, but I was and am happy to pass the mic for a while—at least until I can write some new slam-worthy material. In the meantime, I’m appreciating the creative voices that have joined the law school this year, including those who sounded off at the open mic, last week’s American Idol style talent show (including my favorite performance), or in the law school blogs. I’m especially stoked to flex my legal vocal chords in the Civil Litigation Clinic by meeting clients and preparing for an oral examination at an upcoming unemployment hearing. That is, after all, why we are here. Not to be poets or musicians or comedians, but to become lawyers. Perhaps in my next post I will say a word or two about that.